How can DNA be used to build shapes and structures? DNA usually consists of two strands which are stuck together; by using a single-stranded version, scientists can snap the molecules together like pieces of Lego. The specific pairing of DNA bases – the fact that an A on one strand always connects with a T on the other and a C goes with a G – enables scientists to create different configurations by precisely determining how the DNA molecules will connect together. The first steps towards using DNA to build things were taken by crystallographer Nadrian Seeman in early 1980s. Taking inspiration from naturally occurring DNA structures, Seeman stuck four DNA strands together in a cross; the strands were designed to not overlap completely, leaving the end of each arm of the cross exposed. This allowed crosses to connect to one another like tiles by linking their arms together. A major advance in DNA nanotech was the development of DNA origami, in which short strands of DNA are used to help fold a single long strand into a particular shape. In 2006, Paul Rothemund improved the technique by finding a way to fold a long enough strand of DNA into any shape. 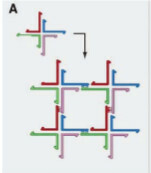 He lays out the shape in a computer program which then designs short “stapling strands” to properly fold the long strand into the desired shape while minimizing strain and tension. 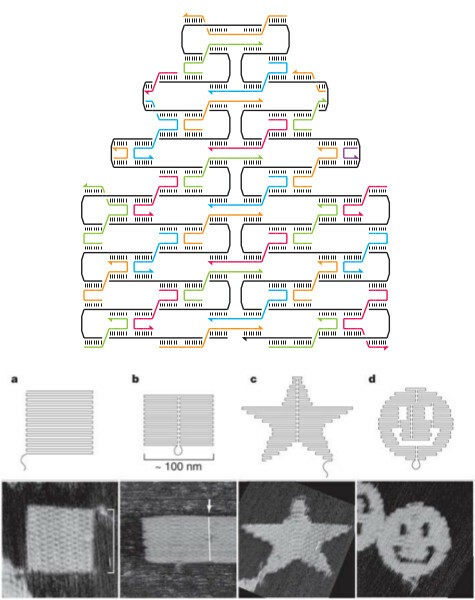 He used this approach to fold copies of the same DNA strand (the whole genome of a virus named M13mp18) into a variety of shapes, including squares, rectangles, triangles, five-pointed stars, and even smiley faces! By designing the staple strands at the edges of a shape to match, he could clip them together – combining triangles to make a hexagon, for example. DNA origami involves folding a single long DNA strand (the black line in the top half) into a specific shape using short stapling strands (the coloured lines). Paul Rothemund used a computer program to design the strands needed for specific shapes (shown in the middle); the last panel shows DNA from a virus folded into those shapes (each panel is 165x165nm). The image is adapted from Rothemund 2006. Another clever trick he developed was to label some of the staple strands so they would stand out against the unlabeled strands, enabling him to draw black & white patterns and pictures in DNA. Using this technique, he wrote the word “DNA” in letters 30nm tall and drew a teeny tiny map of the Western hemisphere using 5.5 x6nm pixels. Smaller pictures have been made using scanning tunneling microscopy, but this technique produces billions of copies instead of just one. Panels a, c, and e show the designed drawings; the actual DNA is shown in b, d, and f. In b & d several rectangles have stuck together. The image is adapted from Rothemund 2006. Using these techniques and others like them, researchers have been able to create all sorts of 2d shapes and patterns with DNA. They can also modify the DNA strands by attaching different kinds of molecules or using synthetic bases as building blocks with different properties. A DNA scaffold has been used to arrange gold nanoparticles in a hexagon, for example, and other metals have also been incorporated into DNA assemblies, offering possibilities ranging from sensing and data storage to artificial photosynthesis. These amazing accomplishments are probably enough to take in for now. Next time, I’ll talk about how DNA nanotechnology has been used to create 3d shapes, including drug delivery systems. Although static shapes are cool, my favourite part of DNA nanotech is using Winfree’s ideas to do computation with DNA tiles. This is a nice area connection theoretical computer science and biology. Alternatively, one can use DNA and RNA to build logic gates and carry out computation right on the DNA strand, or to compile a programming language for biochemistry. Really exciting stuff! I am looking forward to your next post.